Sylvan Dell sent me copies of their newest releases and it just so happened that we liked each and every one of them. In addition to sharing them with you, I am allowed allowed to offer one of you your choice of one of the following titles. So browse through, learn about these new books, and leave a comment below letting me know which one you would most like to win in order to be entered into the drawing. Ten for Me is our top favorite of the new books with multiple requested re-reads right from the get-go! (I know it's a winner when Bookworm1 asks to "read it again!!!" immediately after the first read through! This books combines math and science in a cute and friendly way. It explores the multiple ways that you can count to ten while telling the story of two kids who are out catching butterflies and keeping score on how many each are catching. 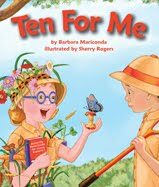 Learn about butterflies and their habits as well as how to get to ten by adding in this book which was written by Barbara Mariconda and illustrated by Sherry Rogers. Prairie Storms walks you through the months of the year on the prairie. 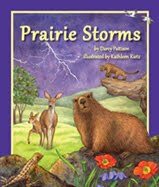 From the snow falling in January to the hot months of August and lightning storms, the young readers get a feel for how prairie life changes as the calendar months go by. The back of the book contains six pages of learning activities, including true/false questions, further information on weather and habitats. * It should be noted that all of these Sylvan Dell titles have activities and further information about their individual subject matter in the back of the books. Animalogy was the least understood by my son (age 4 1/2) but this book contained my favorite illustrations out of the batch. "Deer is to run as mouse is to scurry." just didn't do it for Bookworm1 I'm afraid. It went right over his head at this point in time. However, like I said, the illustrations by Cathy Morrison made this book his and my favorite simply to look at. 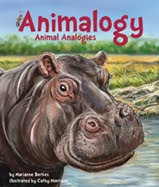 The hippo on the front cover had his IMMEDIATE attention when I opened the package of books. Apparently Morrison began her career in art in animation which explains why all of her paintings make the animals look like they are in motion. Beautiful work! Hey Diddle Diddle: A Food Chain Tale is rather self explanatory. Through rhyme we find out which animals eat which animals. I really wasn't sure what my son would think of this one. He likes animals after all. But I read it to him without any emotions attached. Apparently I should only concern myself with my own emotions. 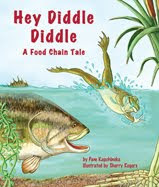 He requested multiple re-reads of this title, animals gulping each other and all! No worries. 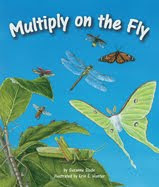 Lastly, Multiply on the Fly combines math and science in much the same way the first title did. However, this one involves multiplication and insects. "Eight daring dragonflies soar into the sky. Each is flapping four strong wings. How many wings go by?" My son seems to have the ability to think in numbers. Even though he's only 4 1/2 he picked up on the concept of this book very quickly and with some careful thinking was able to answer some of the multiplication problems on his own. I think this is definitely a book we can still grow into. It's a fun way to learn. Mommy and Daddy liked this one very much. All of these books are somethin' else and I would have a hard time choosing which title to suggest to you. Therefore I figured I'd present them all and let you pick your favorite! In order to win a copy of one of the above titles, simply leave a comment which *MUST* include a valid e-mail address to contact you at should you be selected as the winner. This contest is open through Tuesday, August 23rd and is open to U.S. Residents only. THIS CONTEST IS NOW CLOSED. THE WINNER (as selected by random.org) is #9 - Stephanie's Mommy Brain. Congrats! Thank you, Sylvan Dell, for sending copies of the above books my way and for allowing me to host a giveaway! Appreciate your generosity! Sign me up! :-). These all sound wonderful! Multiple on the Fly would appeal to my daughter as she is just beginning to learn multiplication. I would love Ten on Me. Thanks! we're all about books. These all look so good. "Ten for Me" for my daughter! I think it would be the most helpful to her right now. I like that it teaches counting in a fun and interesting way! And the illustrations look so cute and fun! She definitely loves being outdoors and exploring bugs and other things too, so this would definitely be a winner and I'm sure she would enjoy it for a long time! You're right, these ALL look great! It's a tough choice but I'm going to say Prairie Storms. It would fit in with our Lewis and Clark study. My 5 year old loves to read! They all sound great but I think I'd choose Ten for Me. I like Multiply on the Fly. I pick Ten For Me! Ten on Me sounds like a book that would be exactly what M enjoys reight now.